For further information please contact the Vicar or Churchwardens as below. St Michael's is a classic Kentish church overlooking Hernhill village green. The church is run as a combined benefice with Boughton and Graveney, with services in all three churches every Sunday, and joint activities also taking place at the parish centre of St Barnabas, in the centre of Boughton village, including the monthly "Messy Church". For more information see "boughton-hernhill-graveney-churches.com"
The church is situated on the top of a hill in the centre of the village. Looking north-east the coast and sea are visible whilst south-east the beautiful landscape across the orchards towards Blean Woods can be enjoyed. There has been a Christian church in Hernhill since Saxon times. The Saxon wooden structure was replaced in 1120 by a stone-and-wood church dedicated to St Stephen. Masonry from the original 12th century building is still identifiable today in the south wall. 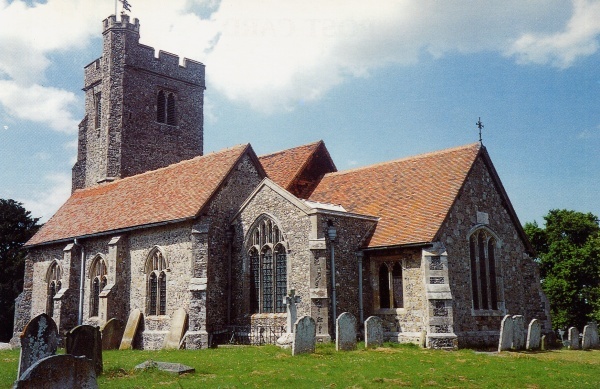 The present stone and flint church, dedicated to St Michael, was constructed on the site in about 1450. It is an excellent example of a purpose built 15th century church and is one of a few wholly Perpendicular churches in Kent. The main door and the bell tower door are fine examples of 15th century joinery and the rood screen a good example of 16th century workmanship. The interior was restored in the 19th century and consequently much of the furniture dates from this period. Like many other churches, St Michael's has been subjected to additions and alterations throughout its history and the most recent extension, to create the Lady Chapel was carried out in 1928. The bell tower houses eight bells refurbished in 1997 and rung by a dedicated band of campanologists. Today the church is regularly used for Christian worship and positioned centrally, the church plays an important part in village life. Parish members are involved in village clubs, including, the WI, the Horticultural Society, the Monday Club and the Dawes Community Association, and they support the Children's Society and the Church Urban Fund.